LOS ANGELES (AP) — It wasn't backed by any Hollywood movie studio. Reviews were mostly negative. It premiered in Houston, not Los Angeles or New York. And yet despite the unconventional release of "2016: Obama's America," the movie is now among the most successful political documentaries of all time — and it doesn't show signs of cooling down ahead of the presidential election. The conservative film exploring the roots of President Barack Obama's political views surprised the film industry when it took in $6.5 million to land at No. 7 at last weekend's domestic box office ahead of three new releases: the Joseph Gordon-Levitt action flick "Premium Rush," the Kristen Bell comedy "Hit and Run" and the Ashley Greene horror film "The Apparition." That makes "2016" the most successful conservative documentary of all time. It's also the sixth overall highest grossing political documentary behind four Michael Moore movies and former Vice President Al Gore's environmental film "An Inconvenient Truth." It all adds up to a remarkable triumph for an indie film that circumvented the liberal waters of Hollywood. The film has continued to do well during the slower weekday period, especially considering that it's been up against the Republican National Convention in Tampa, Fla. Since last weekend, it earned an additional $6.6 million for a total of $13.1 million, placing No. 3 at the domestic box office on Thursday. This weekend, the film expands from 1091 screens to nearly 1,800. Distributed by Salt Lake City-based Rocky Mountain Pictures, "2016" is directed by Dinesh D'Souza, a former staffer for President Ronald Reagan who is now president of King's College in New York and author of several books, including "The Roots of Obama's Rage," the basis for "2016" that claims Obama's beliefs are rooted in the anti-colonialism of his late father, a Kenyan academic who was largely absent from the president's life. The film premiered July 13 on one screen in Houston and slowly expanded over the past month to 1,091 theaters in such cities as Nashville, Tenn.; Baton Rouge, La. ; Denver; Phoenix; Wichita, Kan.; and Washington, D.C. MJM Entertainment's Mark Joseph, who is handling the film's marketing, attested that "2016" had to be promoted differently than typical Hollywood fare. "You can't just throw up your star on Thursday night on a talk show," said Joseph. "That's not how this works. The traditionalist audience needed to hear about the film much sooner than what Hollywood is used to doing. It's also important that they heard about it from people that they trust and admire. It's a different way of engaging the audience." Joseph and the film's co-director, John Sullivan, launched a stealthy campaign for the film that attracted the attention and support of right-wing superstars like Rush Limbaugh and Glenn Beck. Buzz for the movie simmered over the summer, bubbling up last weekend before the Republican convention kicked off Tuesday. "Timing is everything," said Greg Mueller, a conservative strategist whose public relations firm is promoting "The Hope and The Change," a film about voters who formerly supported Obama that debuted Tuesday at the Republican convention and is now available on DVD. "Timing is everything in politics. It's even more important in political documentaries." "Fahrenheit 9/11," director Michael Moore's assault on President George W. Bush, opened at No. 1 with $23.9 million in June 2004, averaging $27,558 in 868 theaters. It went on to become the top-grossing documentary ever released with $119.1 million domestically, a world away from "2016's" haul so far. While the release of "2016" just before the Republican convention and its portrait of a gloomy future if Obama is re-elected might make the film feel like an hour-and-a-half-long political ad, the "2016" filmmakers said they only received funding from private investors, not the Republican party, and the movie's proceeds aren't headed to Mitt Romney's presidential bid. "We wanted none of their involvement," said Gerald Molen, the film's Montana-based producer who previously worked on such mainstream Hollywood movies like "Days of Thunder" and "Jurassic Park," and who won an Oscar for "Schindler's List" in 1993. "It wouldn't have made sense to do that." 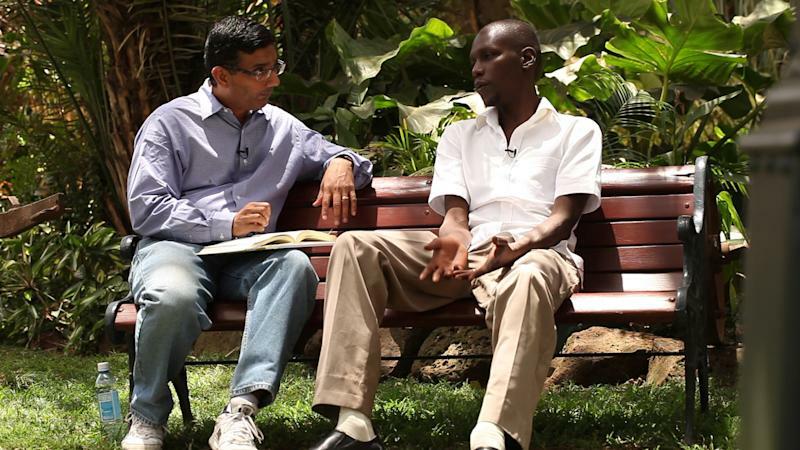 He added that the film's estimated $2.5 million budget only came from about two dozen donors supporting D'Souza. Hollywood has long been inspired by the political process, and such an affinity usually burns brighter during election season when audiences are attuned to politics, whether it's through recent fictional fare like the USA miniseries "Political Animals" and the Will Ferrell comedy "The Campaign" or Moore's "Fahrenheit 9/11," which came out before the 2004 election. Alex Ben Block, a senior editor at The Hollywood Reporter doesn't think that "2016" will usher in a new era for right-wing films, but he believes the unexpected success of the conservative film might encourage likeminded filmmakers to carve out a similar path in landscape that was previously dominated by more liberal filmmakers like Moore. Ultimately, Block said moviegoers will vote at the box office with their dollars. "'2016' has succeeded, but it's going to be very hard to duplicate," said Block. "These things are driven by politics and passion. They're driven by people who are trying to be noticed and make their point. It's a powerful combination when you have a documentary that can be both commercial and have a point of view." Although "2016" has obviously found fans, most critics haven't been kind to the film. Newsday's Rafer Guzman called it an "attempt at character assassination." The Arizona Republic's Bill Goodykoontz deemed it "an exercise in preaching to the choir." The Los Angeles Times' Betsy Sharkey lambasted "2016" for being a "sluggish film" whose "outrage falls flat." "I think '2016' has a nice gimmick because it purports to show what the future will look like right there in the title," said film critic Ben Mankiewicz, who dismissed the film as an actual documentary and is unsure what its unexpected success means for the film industry. "I think it is another reminder of how many people in this country find Obama so shockingly unlikesome that they are seemingly ready to believe the most nonsensical theories about him." Many of the assertions D'Souza makes in the film to support his point that Obama's presidency is an expression of his father's third-world political beliefs don't hold up, including that Obama removed a bust of British Prime Minister Winston Churchill from the Oval Office because Churchill represented British colonialism and that Obama has "done nothing" to impede Iran's nuclear ambitions. And there are other instances where the film takes liberties with the facts. "I don't necessarily agree with everything that's in the movie," said Arthur Hobbs, a retired engineer who caught a Monday matinee of the film in Los Angeles with his wife after reading about it online. "But I do think that we really don't know everything about Obama, even after he's been in office for four years. I think that's why we needed to see this movie." Molen said he expected the bad reviews. The filmmakers, who plan to expand the film to even more cities in the coming weeks and keep it in theaters until early October, aren't fazed by any negative reaction. They just hope now that conservative audiences have found "2016," perhaps left-leaning moviegoers will be curious enough to buy a ticket. "My wish is that people see the film and make an informed decision," said Molen. "I would love people to see the film and come out of it saying, 'I need to know more. I need to find out more about this country and what we're designing for our kids, grandkids and great grandkids.' I just want this film to spark an interest in people to find out more." Associated Press writer Beth Fouhy contributed to this story from Washington.